Who doesn't love potatoes? My kids are happy if i make them everyday. Infact i keep atleast one boiled potato handy for my lil one's lunch time tantrums! My elder one loves spicy and tangy food. His tastebuds are on a roller coaster ride recently, a child who loves only Dal-chawal and dosa wherever he goes, is now ready to try everything, but wants it all spicy. While deciding on lunch box dishes, i kept him on mind and made certain dishes. He has stay back classes for his music practice in school. So those days, i pack him another box for his lunch usually rice and curry. He prefers jeera rice and dal, if i m packing mixed rice like tomato rice or mint rice, he wants a spicy side-kick potato. This imli aloo is made specially for him, the day i served him this, he was licking his fingers and wondering, why is the potatoes tangy!!! This curry is in our regular menu now! 1 tbsp tamarind pulp, thick pulp or just soak little tamarind in 3 tbsp of water and extract it. Wash and peel the potatoes. Chop them into cubes and cook them until soft. You can either use the microwave or the stove-top. I cooked on stove top, boiled the potateos and took it off the stove and keep it covered for 10 minutes. If making your own tamarind extract, soak a small grape size tamarind in 3 tbsp of warm water for 15 minutes and extract it. It should be thick, as we will be adding it to the cooked potatoes, if more runny, it might make the potatoes lil soggy and mashed. So keep the extract thick. Once the potatoes are ready, heat oil in a pan, splutter mustard seeds, add hing, curry leaves and cumin seeds. saute for a minute. Next add green chili and turmeric powder. Next add cubed potatoes and saute well in the oil. Now add red chili powder, coriander powder and salt. Mix the potatoes, now add the thick tamarind extract, mix once and let it cook covered for 5 minutes, until the flavors mingle. Remove the cover and cook for another 5-8 minutes, until they turn crisp. Keep the flame simmer while cooking, or else the potatoes might burn. That is an awesome addition to the potatoes Priya. Next time I will add some tamarind pulp while making roast for Sruti. Even she is craze about potatoes and she can have it everyday. This is a perfect side for rice.. Potatoes and kids love for them is universal, I guess.Potatoes can do wonders to their appetite and moods. The addition of tamarind definitely enhances the taste. Good one! Imli Aloo looks yummy!!! Never tried potatoes with tamarind, sounds interesting. Will give it a try on next time when i prepare potato fry. 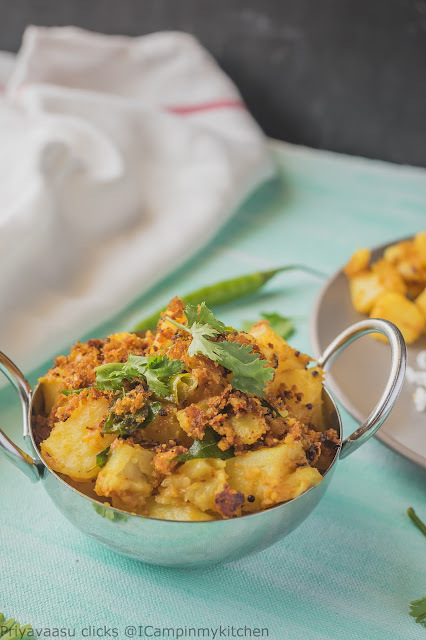 Omg, this tangy potato will definitely please my tastebuds without any fuss, and that plate with rice kollu masala and imli potato is very tempting, my mouth is watering here. Potatoes are my favorite and any recipe with this super duper ingredient is loved by me. Imli is another ingredient which I love, ah !,,these chatpata aaloos would make such a delicious dish. Bookmarked to make asap. Omg drooling , such amazing tangy twist to the potato fry :) This am amzing side kick side dish for sure .. looks fantastic !! So nice to read about your kid and his schedule..nice to include dishes they eat right! the setup looks cool! Such a brilliant pick for I. Anything with potato is always a perfect one.. Will definitely try this out!! 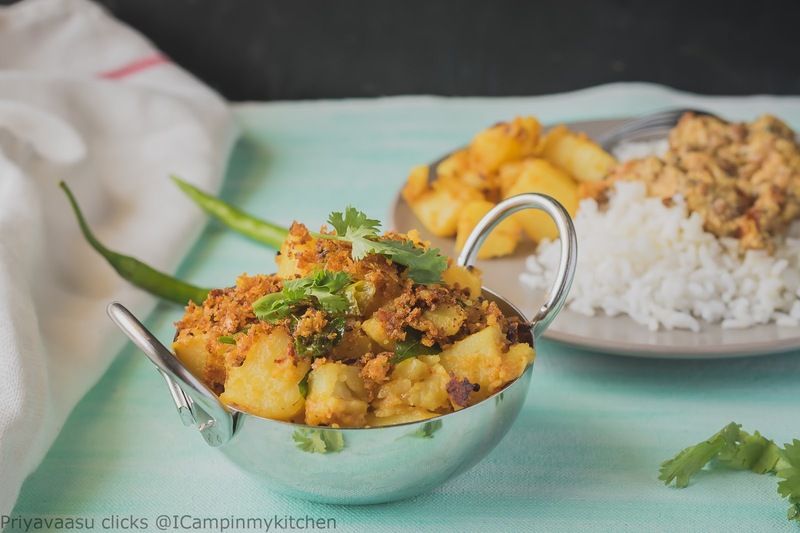 I have to try this tangy and spicy potato curry for my potato loving son. He prefers potato roast most of all, but he’s usually ready to try anything with potato. Will try this yummy curry for him. Very nice. Kids taste buds always differ and glad he likes to try all food especially spicy. :-) It gives us lot more options. The imli aloo sounds tasty and love that cute little kadai. I love adding tamarind to potatoes and often love to have it as a snack or as a healthy meal. 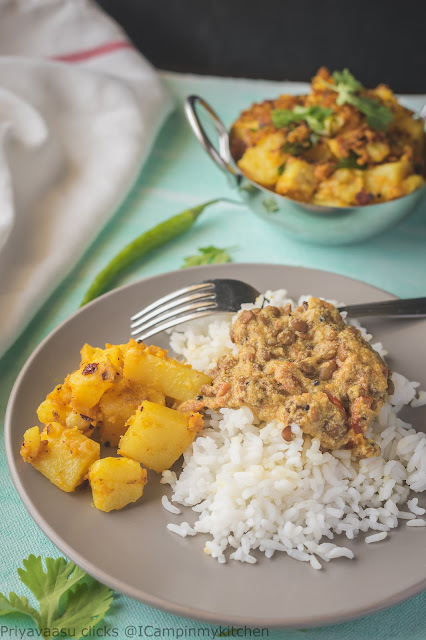 I remember making the imli aloo a few years back and totally loved the flavors of imli in the aloo. Love the entire setup and pictures. Loving this tiwst to potato fry. I guess kids and adults would like it alike. Potato and imli both are mine fav ingredients love the combination as veg... looks inviting. these potatoes sound wonderfully flavorful. I would love to have these for dinner tonight I need to get out and get some of the ingredients. I am a big potato lover, imli with aloo simply mouthwatering. Will definitely try this out. Bookmarked!! I got soooo curious about this tangy tamarind potatoes... in the Philippines we have tamarind but I cannot get hold of one in the USA. I would love to try this if tamarind in available here. Nice and tangy aloo ki sabzi. I am a lover of Indian food and this dish looks fantastic, would have never thought of combining tamarind with potatoes. Imli and Aloo. Interesting combination and beautiful shots. It would be nice to add some twist like this in fry. Will give a try. Thanks for the share. I like the sound of tamarind in my aloo bhaji. This sounds so delicious. I bet it would be perfect with Dosa and sambar too! Tamarind has a unique sweet and sour taste I love very much. I love how versatile potatoes are! It sounds like your kids get awesome lunches! Love this simple recipe that addas such a unique twist with the imli! I am a huge imli flavor fan, so will surely make this. I think we've been stuck making potatoes the same old way for a long time!! I can't believe the spices you use. I bet the aroma is heavenly. This is definitely on the menu. 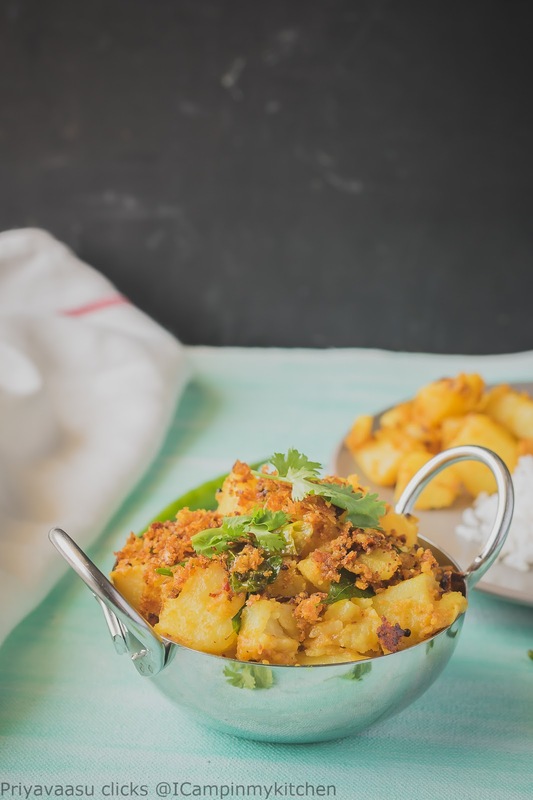 I never made sabji with potato and tamarind together, I will give it try, I usually use it in sambar with potato but this sounds and easy side dish. Potatoes are loved by all and thus is handy to cook. Imli aloo is new to me, should try this version sometime. I love aloo too but we are trying to avoid as mush as possible, but these Imli aloo are my favourite, we gujju make with gravy though. this tangy potato with tamarind sounds delicious, and finger licking.looking so inviting in small pan. lovely clicks. Potatoes and tamarind make a lip smacking combo and I have used it in chaat and Kutchi dabeli..will try it in curry now. Thanks for the flavorful share ! Imli aloo looks so tempting.Something totally new for me.Bookmarking this innovative recipe.